Morihei met with Takeda Sokaku ( 1859-1943), the “reviver” of the Daito-ryu, in February 1915, when engaged in development work in Hokkaido. He immediately became Sokaku’s student, training under him whenever he could. On March 1916, Sokaku rewarded Morihei with a teaching license and certificate of mastery in the school. Morihei’s relationship with Takeda Sokaku was different to any he had with previous jujutsu teachers. Morihei remained a dedicated student of Takeda Sokaku until he passed away in 1943. A newspaper reporter posed a question to Morihei in later years. “Did you discover aikido when learning Daito-ryu?” Morihei replied, “No. It would be more correct to say that Master Takeda opened my eyes to budo.” He taught Morihei if studying the combat arts, then one must do all in his power to win. Morihei, however, started to have misgivings about the idea of winning at all costs. This skepticism guided Morihei’s a transition from “jutsu” to “do”, i.e. from an emphasis on winning through technical proficiency to a ‘Way’ of personal cultivation. Morihei had a religious temperament and he often made reference to the word “kami”, meaning ”divine” or “gods”. His intention was to discern between martial techniques for combat and budo for peace and harmony, the distinctive fundamental spirit of aikido. In simple terms, he deemed it more important to find common ground and accord with others, than using strength and fighting to overcome them. As the premise for aikido is accord and harmony, there are no offensive techniques used to initiate the engagement. The uke acts as an aggressor and initiates an attack, and the tori uses his or her techniques to defend. Because of this, there are no matches in aikido, and no competitive randori (free sparring). ‘There are some who reject the idea of ki as unscientific. Some people also use the term with great frequency, and it has a different meaning for each individual. Morihei believed that ki was the energy that bound body and soul together. Ki is the source of human vitality and is the energy that flows through all natural phenomena. 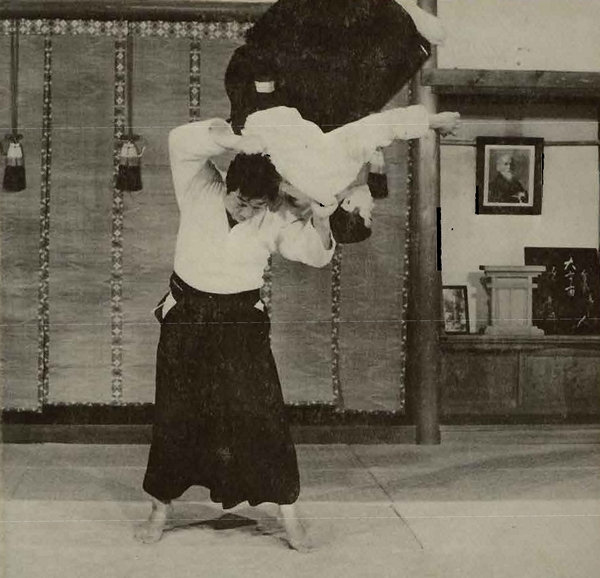 In aikido, all techniques are based on circular motion. You throw your opponent by maneuvering in a circular manner. Spherical movement allows the practitioner to avoid collision with opposing forces and facilitates harmony. As movements are smooth and devoid of erratic interruptions, ki is able to flow smoothly through the entire technique without diminution. demonstrating “stillness within movement” (sei-chii-do). bandits. Bullets hailed down on them from all directions, and just as Morihei thought all would be killed, he suddenly he felt composed and focused. He somehow managed to avoid being hit by any bullet by sensing where it was coming from, and dodging them on the spot by turning his body without jumping out of the way. This tranquillity is described as “sumikiri”. He later described this experience of sumikiri and .rei-chu-do as enabling him to sense hostile or murderous intentions in others. Although holding mysterious attraction for many people, it must be remembered that this remarkable episode came after many years of austere training in the study of the imperative substance of maintaining an immovable center. The first step in keeping “centered” is to breath from the seika-tanden which is located just below the navel. Controlling breathing enables the natural rhythm of ki to flow throughout the body in complete synchronization with universal energy. The seika-tanden is also referred to as the “Hara”. ‘The term “hara ga suwaru” (the hara sits) is used to describe somebody who is calm and serene. Such mental imperturbability and inner-strength are achieved through training the physical body. Before training commences, aikido practitioners often do an exercise called ‘furitama” which is intended to focus ki. This and respiratory exercises are very important in the study of aikido. harmoniously and naturally, even if they do not seem to be circular. Morihei explained the never-ending transition in aikido. In this way, if the practitioner is able to fix the center of mind and body, ki will flow unconstrained, and he or she will be able to perform a myriad of technical variations. This is what Morihei meant by there being “no set form in aikido”. As long as the principle of ai-ki is present, then all techniques are in accordance with aikido’s philosophy. The center is maintained in both physical movements and in the mind. By cultivating the center over many years the trainee learns to move adroitly both physically and mentally and will learn how to avoid confrontations with others. Ultimately, the student of aikido will learn to embody the mental composure and physical dexterity to deal effectively with whatever situation he or she is faced with. The Aikido practitioner also learns respect for other people, and to value harmonious relations. To achieve the stated objectives of aikido requires that techniques must not be studied half-heartedly. There is no point in which a waza, a technique, can be called perfect. With continued training, waza improvement has no bounds, nor does the potential for nurturing one’s qualities as a human being. This philosophy exhibits the culmination of aikido ideals. The most important aspiration in aikido is to rid oneself of enmity and the urge to vanquish one’s opponent. You will never be able to master aikido without ongoing training. When you have trained long enough to be proficient in the techniques, the joy and depth of aikido will become more apparent and will provide even greater impetus to continue. Follow the instructor’s advice respectfully, and observe his or her techniques with an open mind. Even if you believe that you are executing the technique the way you were taught, it is natural to encounter difficulties in the beginning. You should try to discern why or how your technique differs from that of the instructor. Being compliant, but simultaneously curious and inquisitive, is the fastest way to learn. No Replies to "Concepts and Techniques of Aikido"